In a small saucepan, combine the blueberries, sugar, zest and two tablespoons water. Cook over medium heat, stirring occasionally, until the blueberry skins have popped and the mixture has reduced slightly, about 10 minutes. Meanwhile, combine the amaranth and milk in a medium lidded saucepan and bring to a boil. Reduce the heat to low and simmer, covered, until the grains are tender and thick, about 15 minutes. Stir in the maple syrup. 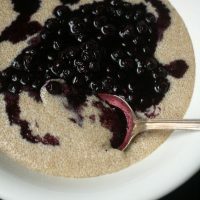 Serve the amaranth pudding in bowls and top with the blueberry compote and walnuts.